Paradox Interactive, a company that makes games and announces release dates, has revealed that Crusader Kings II: Conclave will be available on February 2, 2016. Your chancellor wants you to press his claim on a neighboring county. Your marshal is a bit of an incompetent. And no one thinks you should execute your uncle, like you had planned to – even though he’s a nasty rebel. Difficult problems with easy solutions? Not quite. Crusader Kings II: Conclave, the newest expansion for Paradox Development Studio’s celebrated medieval grand-strategy game, will bring out the politician, diplomat or tyrant in you as your royal council demands to be heard – and the loudest voices demand a seat at the table. Paradox is happy to announce that this new expansion will be on February 2, 2016. Conclave adds greater depth to ruling your realm with a host of new laws and council interactions. Will you placate your vassals by giving them a say in matters of war and peace? Will you raise the status of women in your kingdom by recognizing their right to inherit lands and title? Can you find a place on council for that one duke who has too many armies to ignore, but no talent for anything? 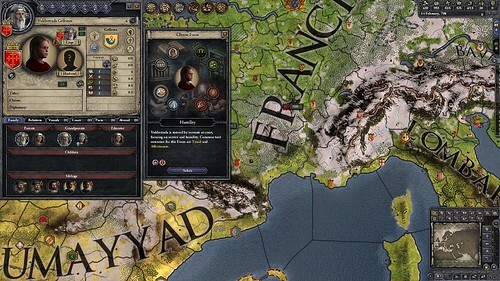 This expansion will also increase the importance of marriage alliances, introduce systems to block rapid overexpansion, and allow you to rent out some of your soldiers as mercenaries – just because you’re not at war doesn’t mean you can’t make a ducat or two off someone else’s aggression. So mark the date on your calendar – February 2, 2016: the day that Crusader Kings II challenges you to up your king game. Be ready for Conclave. It will be available from major digital retailers and the Paradox store for $14.99, 10.99 GBP or 14.99 Euros. A new expansion means I can get the last one at a discount, so many have been released for this game. Almost as bad as Train Simulator. How is adding content bad? It's the unit pack and portait images that are bad. Excited about this, even though I haven't been playing much lately. I obviously buy them or I would not be in the thread, just saying that there is a lot of DLC for this game.